3. Park 'n Save Lot - long-term economy remote lot: Follow signs for remote parking or exit 1-95 at Griffin Rd. Go west on Griffin to Anglers Ave., then north to 42nd St.
First 2 hrs $1.50; each add'l hr $0.50, up to max. $9 daily. 1. Free Cell Phone Waiting Area - It�s lighted, paved, and just off the main entrance roadway. No commercial vehicles and no unattended vehicles. Ideal for curbside pickup if you arrive early. Easy access from I-595, US-1, and Griffin Road, seconds from the arrival level and terminals. Friends or relatives dropping off or picking up at the airport can also take advantage of FLL�s self-parking grace period. Exit and self-park lot within 15 minutes of entering and there is no charge for parking. After 15 minutes, normal garage rates apply from the time of entry. (d) Valet Parking: Terminals 1, 2, 3, 4; Follow signs for Daily Parking to Valet/Premier parking sign. For high clearance vehicles, the Hibiscus Garage has a clearance of 8' 2." The clearance for the Palm and Cypress Garages are 7' 2." If your vehicle requires higher clearance, the Park N Save remote parking lot offers unrestricted height clearance. Terminal 1: Concourse B - Frontier, JetBlue, Southwest; Concourse C: Continental, Continental Connection, JetBlue, Midwest. Terminal 2: Concourse D - Air Canada, Allegiant Air, Comair, Delta, Delta Connection, Midwest. Terminal 3: Concourse E - AirTran, Bahamasair, US Airways; Concourse F: American, American Eagle, CanJet, Sky Service, SunWing, TED, United, USA 3000, West Jet. Terminal 4: Concourse H - Air Jamaica, Air Transat, Avianca, Spirit, Zoom; Commuter Terminal - Air Sunrise, Chalks Ocean, Lynx Air, Vintage Props & Jets, Yellow Air Taxi. Watch for Tram stops on the lower level of the Garage Complex. The Trams run every 8 minutes and will transport you quickly and effortlessly to your terminal. 3. Valet/Premier Parking - Valet/Premier Parking offers the ultimate convenience to travelers who want to simply drop off their car. Valet parking is Terminal parking, and a whole lot more: enjoy express vehicle return with no waiting and express exit from the Garage Complex. Plus, a number of car care services are available, including a full-service car wash, and wax and detail. 4Park 'n Save - Long-term self-parking is available at the Park N Save lot. Free shuttles to the terminals operate from this lot every 15 minutes, 24 hours a day. Watch for Shuttle stop signs at shelters. Terminal drop-off and pick-up stops are at each terminal building, lower level crosswalk (Baggage Claim). Upon your return, you can catch the Park N Save shuttles back to their car at this location. Car care services also available. (a) Garage parking and Remote lots fill up quickly during holidays and peak travel periods; they are available on a first come first served basis. 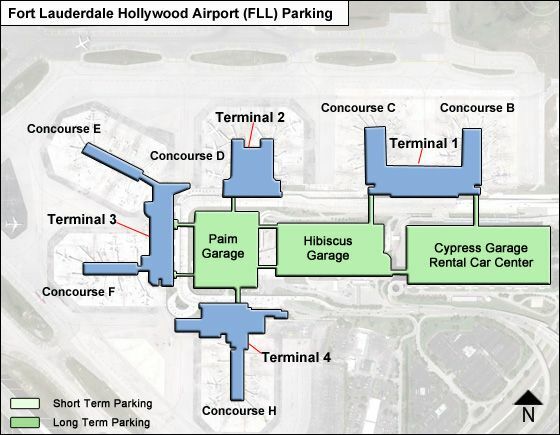 (b) FLL Airport provides a 15-minute self-parking grace period. Exit any self-park lot within 15 minutes of entering, and there is no charge for parking. After 15 minutes, normal garage rates apply from time of entry. (c) Vehicles left over 60 days are subject to removal at owner's expense. For the most up-to-date parking information, call the Airport Parking Office at 954-359-0200, or listen to the Airport radio station, 1670 AM, available within two miles of the Airport.